Liros Gallery owner Serge Liros’ current favorite painting, 3 Masted Schooner, by James Gale (1855-1931). The gallery specializes in 19th and 20th century art. 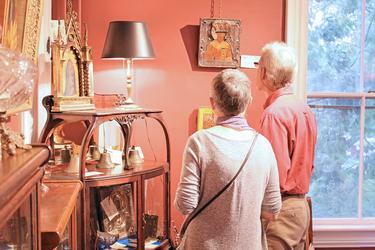 Welcoming art lovers and collectors in Blue Hill for 32 years, Liros Gallery has roots that reach back to 1966, to when Serge Liros first opened his gallery in Virginia. 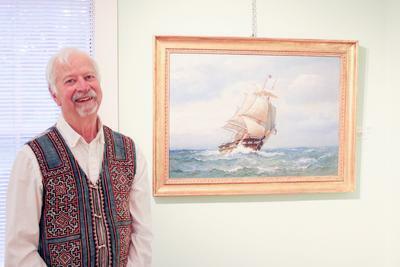 He and his now ex-wife moved to Brooklin in 1986, tired of the traffic and pace of Virginia metropolitan life, and opened Liros Gallery on Blue Hill’s Main Street, moving to Parker Point Road 10 years ago. 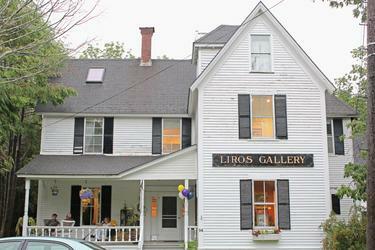 Last month, he listed Liros Gallery for sale but that doesn’t mean it is closing any time soon. 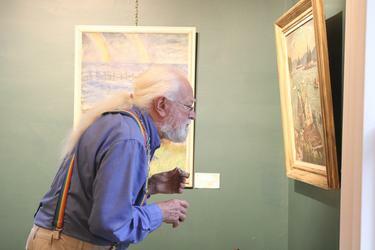 Liros is 77 years old, although his age or any ill health was not obvious during the gallery’s season opening reception June 28. Despite driving rain, the rooms held a steady stream of visitors. “I wouldn’t miss his opening,” Olenka Folda of Brooklin said, as she and her friend Karen Foster enjoyed hors d’oeuvres and gazed at paintings. Liros specializes in 19th and 20th century art, bucking the current art world’s focus on modern and contemporary work. He also devotes one room to Russian icons, a nod to his heritage, and offers framing, restoration and appraisal. But, like many brick-and-mortar businesses, the internet has left its mark on galleries, making it more difficult to buy inventory and to find a good deal, Liros said. And consumer tastes have changed as high tech items become more prized. The Liros Gallery at 14 Parker Point Road is listed by Legacy Properties/Sotheby’s for $950,000. Visitors to Liros Gallery’s June 28 reception examine Russian icons. The Liros Gallery is listed for sale but owner Serge Liros plans to keep it open. He held a reception June 28 to open the season. Visitors to the Liros Gallery June 28 opening reception view 19th and 20th century art.